The deal event for your devices. For one day only, get incredible discounts on thousands of TV shows, movies, music, apps, games and more. I worked with the Head of Marketing of the Amazon Appstore to discuss concepts and user journeys through 'Digital Day.' The concept first began as having daily deals for appstore users, but then shifted into a bigger one day event. 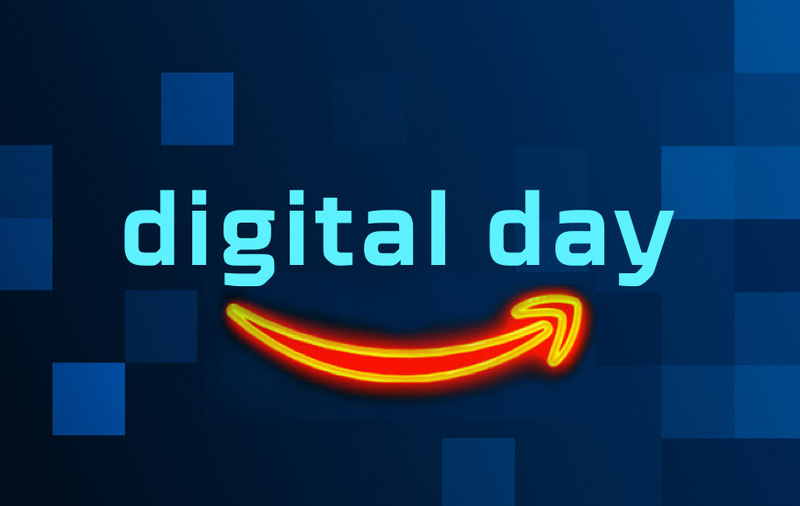 Modeled after Amazon Prime Day, Digital Day is focused on digital content such as movies and ebooks, offering the best deals across digital apps. Upon discovering the main landing page, Amazon users needed to clearly and easily navigate different categories of deals, such as "Pass the Popcorn" for movies and "Get Your Game On" for games. Once users were on the specific category page, the products were organized and visible to quickly checkout. Leading logo and visual concept ideation, I took inspiration from digital technology symbols and neon signage. I wanted to be able to delight and engage users with bold, striking colors. Working closely with the marketing and design team, I was able to quickly iterate on visual treatments and layouts within the Amazon grid system. As a team, we agreed upon a blue theme for the Digital Day visual branding. Launched on December 30th, 2016.